From award-winning classics like the Super SportsDisk to newer creations like OGOBILD, we don't just design toys or sporting goods - we design something more...We design active play for all ages. We design endless hours of fun for your children. And hours of fun with your children. 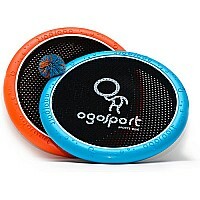 OgoSport was founded in 2004 by a duo of accomplished designers from world-renowned school of design, the Pratt Institute. Our talented roster of creators formed the company to question the current direction of play, and these inquires have inspired us to seek new directions in product development.